The Lacy Heart Scarf is made up of many lacy hearts and is the perfect scarf to make to keep a loved one warm and cozy. It is, perhaps, the ideal Valentine’s Day gift. The pattern has two widths. The narrow version was made with a heavy worsted weight yarn and the wider version was made with a lighter worsted weight yarn. It is a challenging pattern, but worth the effort. The Silk Garden Shawl is a quick to knit shawl that can be used to accent a turtleneck or a suit. The special shaping creates a shoulder hugging shawl. It was made with two skeins of Noro Silk Garden, a worsted weight yarn. 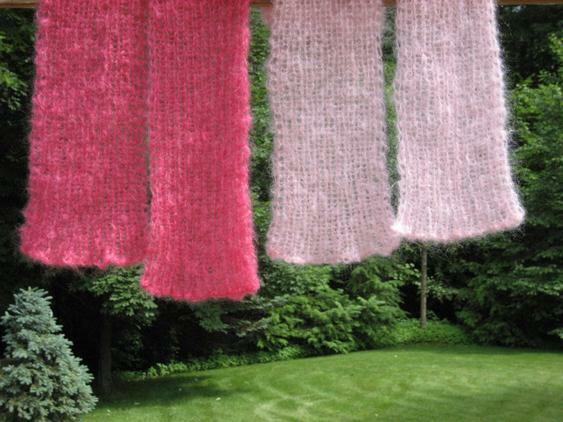 The Fluffy Mohair Scarf is a quick and easy to knit scarf that is reversible. The cast on and bound off edges are slightly ruffled and add a special look to the scarf. 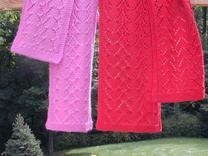 It is made with one skein of a light worsted weight mohair. It works up fast for those last minute Christmas gifts. The scarf is light, fluffy, soft, and very warm. The Diamond Lacy Scarf is an easy to remember lace pattern and is a nice introduction to lace knitting. The pattern has two widths. The narrow version is made with a heavy worsted weight yarn and the wider version is made with a lighter worsted weight yarn. 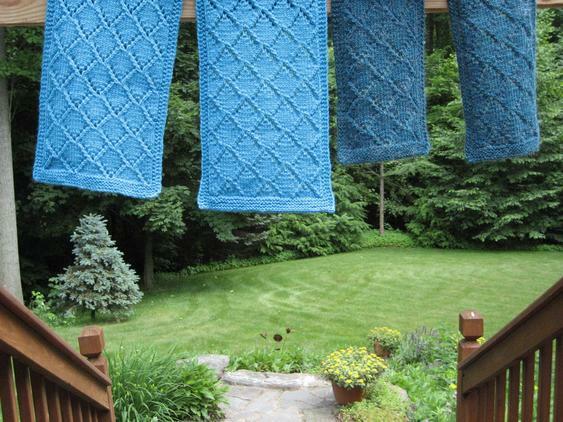 The Sampler Scarf is done in several knit and purl patterns. Each stitch pattern is reversible so the scarf looks the same on both sides. 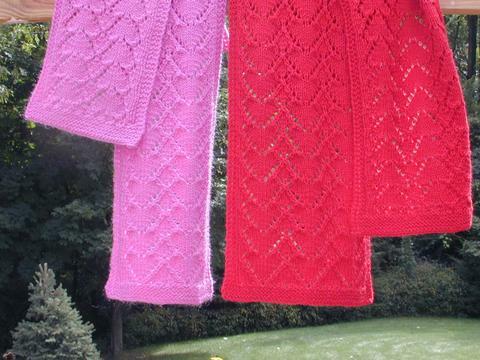 This is a wonderful pattern for the beginning knitter. Worsted weight yarn is used for the scarf. 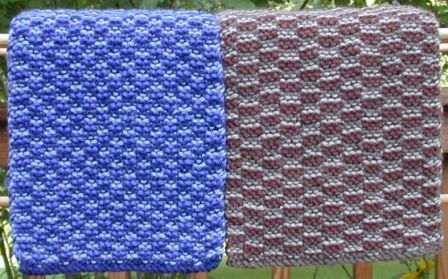 Ribby Garter Scarves can be made with three colors of worsted weight yarn for a lovely multi-colored effect or they can also be made in one solid color. The scarfs look the same on both sides. The pattern includes two variations. 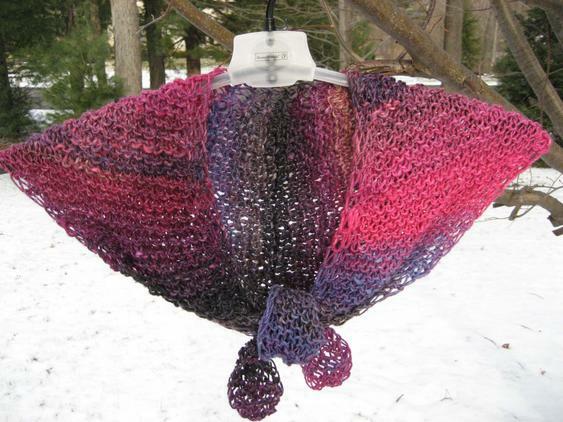 The Saratoga Shawl is a quick to knit shawl. Special shaping creates a shoulder hugging shawl that can be tied in the front or pinned. It can be made in any weight yarn from lace weight to bulky. Your choice of yarn will determine whether the shawl is dressy or casual.